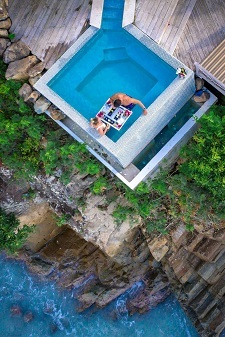 Cocobay, an exclusive getaway on the sunset side of Antigua, offers many unique experiences for the most discerning traveler providing a blissful atmosphere among its gingerbread fretwork, sandy beaches and plantation-style Caribbean chic. 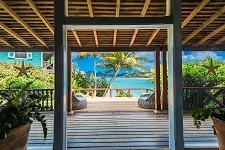 An all-inclusive Antigua Resort, Cocobay is a colorful collection of pastel cottages crowning a breezy hillside undulating down to two white-sand beaches and miles of turquoise Caribbean Sea. Blessed with some of the most dramatic ocean views on the Island, a simple and nature-filled aura surrounds Cocobay. Choose from 49 private, authentic, Caribbean cottages and 4 plantation houses each enjoying a private verandah with striking sea views and custom designed wooden furniture. The 4 hilltop plantation houses are specially designed for families or two couples traveling together. Have a look at our rates here. With romance being the main focus, Cocobay Resort provides excpetional Caribbean Wedding Packages and is the perfect place to spend a tropical honeymoon. There's lots to do here; we offer Sunfish and Hobie Cat sailing, kayaking, snorkeling, guided nature tours, frequent live entertainment and a weekly Manager's Cocktail Party. Tennis and golf are available at the nearby Jolly Harbour Complex, which also offers a number of casinos, restaurants and bars for those interested in sampling the Antigua Nightlife. Our Tour Desk can arrange several exciting trips and outings including the popular Adventure Antigua Tours. If you're more into the relaxing activities, guests can visit the Wellness Cottage for massage therapy and beauty treatments. 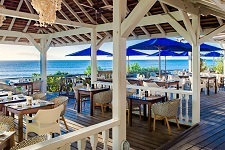 The resort also features two exotic restaurants, each providing an exceptional dining experience. Come find your true sandy sanctuary, let time drift and fall in love anew as you bask in barefoot luxury and superb natural beauty. 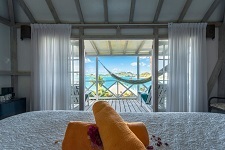 Book with us now and embark on your most pleasant Antigua vacation yet.